Breakfast is a good way to start the day. On holidays and special occasions, like when company came, my mother used to cook French Toast. Since she didn’t make it often, I suppose that is why I never did. I preferred toast, pancakes or biscuits except on vacations and occasionally at a restaurant (if it looked too good to pass up). Then I would order a fancy meal – French Toast with bacon and eggs. Dining at restaurants is a luxury most of us in the fast-paced living of the 21st century are accustomed to, including expectation of top-notch service. But how many people consider the skill required in preparing such fine cuisine? I learned a little about the role of chefs recently when I enjoyed breakfast at a country club restaurant. My friend and I arrived close to the switch-over time between breakfast and lunch. If we ordered quickly, we were told, we could still have breakfast. I love breakfast, and that is what I was looking forward to. Although I had previously seen the menu on another occasion and knew what I wanted to order, my friend had eaten the French toast and was telling me about it. Being the food blogger that I am (always taking photos of food), I ordered both omelet and French toast. First, however, I ordered the omelet. Then right at the last minute I asked if it was too late to add the French toast to the order. The French Toast breakfast item on the menu at Sand Trap Grill was just too good to pass up. It’s made with this incredibly melt-in-your-mouth Angel Food Cake and strawberries. So I was delighted when the waitress came back to the table and said there was time to get the French toast. The line cook came to our table later and thanked us for understanding that he needed the breakfast order quickly. He told me he thought the order was for two people. He explained how he starts the process of preparing for the lunch menu. It was interesting finding out from him the different duties and ranks of chefs. Know how to use knives, pans, grill, etc. Garnish the food and serve on plates according to the chef’s/restaurant’s guidelines. Those duties listed above give an aspiring line cook an idea of what that type of position will require. Although I am no professional in the culinary field, I find it fascinating. The little knowledge I have of it goes back to my assisting the top chef in the tea room of my sister-in-law’s Victorian-style craft mall in Texas years ago. My usual “line cook” job was to prepare, arrange and serve salads. Until this day, I enjoy creating attractive, delicious salads. The difference between a cook and chef depends on the amount of education and experience. Breakfast dining at Sand Trap Grill has been a delightful treat. The beautifully designed entrees portray the elegance mastered by an experienced and educated chef. Clearly, the Executive Chef (or the chief chef) and Sous-Chef (second in command) can count on the line cook at this country club grill doing a superb performance anytime. Visit Miz Helen’s Full Plate Thursday for delightful recipe ideas! 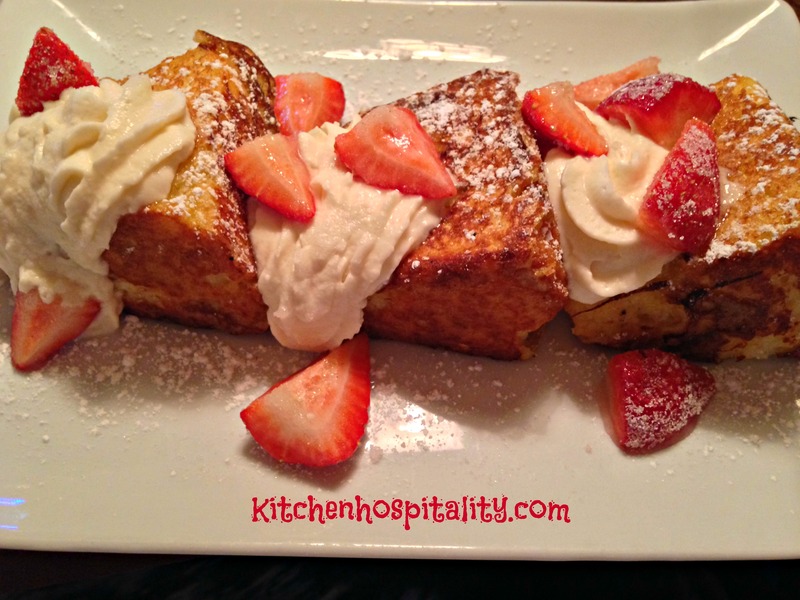 I was honored to have “French Toast with Strawberries” featured on Miz Helen’s “Full Plate Thursday”! If you haven’t visited Miz Helen’s Thursday “Full Plate” blog, you’ve just got to take time out and do that. There are so many wonderful recipes, and you’ll love reading the stories that go along with them as well. A big thank you to Miz Helen for the red plate this week!!! Marissa, you would love it! It does taste delicious. Your French Toast with Strawberries looks like a very special breakfast treat! Hope you are having a great day and thanks so much for sharing with Full Plate Thursday this week.